With Halloween just around the corner, now is the time to start your party planning! Here at Halloween Horror Shop we have everything you need to make this year’s Halloween party the best yet! Make sure you have the best decorations, lights, props and accessories ready to go for the perfect spook-tacular celebrations. In this blog we want to showcase some of the fantastic decorations that will make the best kids Halloween parties! Make an impression as your Halloween party guests, family and passers-by approach your house with our fantastic Inflatables! 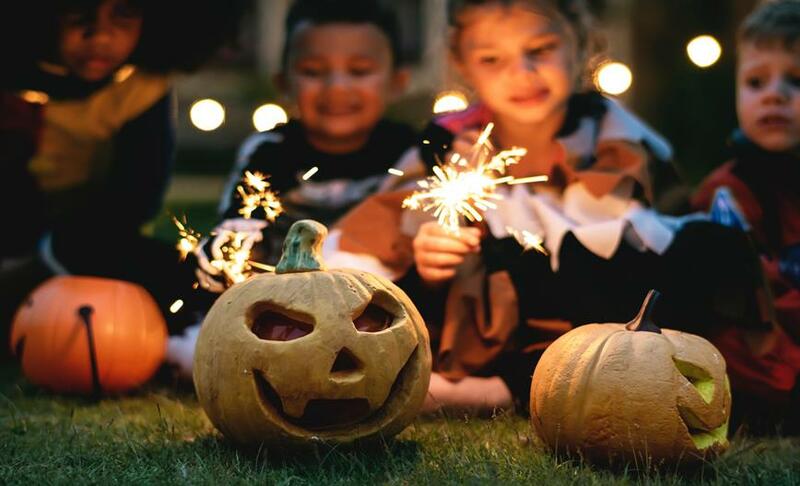 If you’re looking for kid friendly ideas, we have lots of vibrant spooky designs such as our Boo Inflatable and our Bat on Tombstone Inflatable. All our inflatables are fully self-inflating and come with supporting guy ropes and pegs so are very easy to set up and display! The bright colours and cute characters in these inflatables makes them perfect for a child’s Halloween party! Add cool lighting effects to the inside or outside of your home with our fantastic Halloween projectors. We have two wonderful variations, our Ghost Projector and Spooky Characters Projector that will give any party a frightful atmosphere, and we reckon will love the fun projections onto any wall or surface around the home! Another great decoration that you could use in doorways to greet party guests is our 3 Skull Stack Decoration. Each skull has built in red LED lights so will be a fantastic option for any home during both the day and night! Our Hanging Flying Ghost Decoration will be loved by all your party guests this Halloween! Watch him float around your home like magic! This decoration will be perfect for stretching across rooms and doorways and this animated ghost will keep flying along the cord, turning as it goes and emitting a scary ghost sound. How cute are these little characters too?! Our Twin Pack of Tinsel Decorations featuring a pumpkin and ghost are ideal for hanging in windows to help greet the little people to your Halloween celebrations. In our fantastic 50% sale, these decorations are just £1 so why not collect multiple sets to scatter around the house to keep a theme running throughout! We love our Pumpkin Bucket! Great for placing around your home or party venue as a decoration or give to children to take out during their trick or treating fun to collect their goodies! A fun and colourful accessory for children of all ages! Now onto what might be seen as the main feature of a Halloween gathering - the buffet table! It’s guaranteed that when the buffet opens at your party, kids and adults alike will flock to grab some goodies! So make sure your spread is looking its best with some of our great Halloween Decorations. How about giving your party food a spooky backdrop with our Bloody Patterned Tablecloth? Great for keeping a spooky atmosphere running through all areas of your party! And make sure you have lots of plates and cups at hand to serve your treats on, such as our Colourful Skeleton Pack of Plates and Cups. These vibrant patterns make them perfect for parties and is great that they come as a matching set! Kids of all ages will love these Spooky Screaming Straws and will be great fun at Halloween parties and gatherings! With each sip of your drink the straw will emit a monster screaming sound! With two spooky designs available they’ll add fun to your celebrations and would be great for placing on tables or in party bags! We have a huge range of decorations available now on our Halloween Horror Shop website that will be perfect for children’s parties, whether you’re planning a big ‘do’ or just want to trim up your home. Why not check out our full ranges of Halloween Inflatables, Lights, Decorations, Props and Fancy Dress Accessories, where we’re sure there’s something to suit all tastes and budgets! There’s also still time to make use of our fantastic 50% sale available throughout October, so why not grab a bargain for Halloween 2018? !